When you stay at Safari Island Resort in Mushimasgali, you'll be on the beach and 14 minutes by foot from Fish Head Dive Site. Featured amenities include a 24-hour front desk, laundry facilities, and a library. A roundtrip airport shuttle is provided for a surcharge during limited hours. Located in Thoddoo, Serene Sky Guest House is within the region of Miyaru Faru Dive Site and Beyru Kandu Dive Site. A ferry terminal shuttle is available for a surcharge. 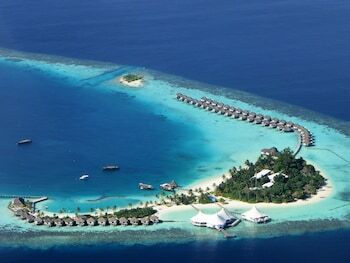 When you stay at aaaVeee Nature's Paradise in Dhoores, you'll be on the beach and steps from Vommuli Pier. Featured amenities include dry cleaning/laundry services and a 24-hour front desk.